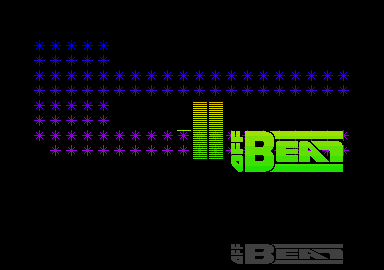 Gunnar started programming music for the german crew Offbeat in 1989. 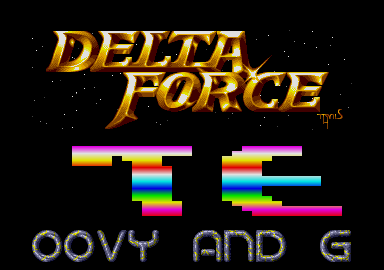 Right after switching to Delta Force he developed his own unique chipmusic-style with very elaborated drum-sounds and pleasing melodies which are mostly build upon a deep mid-tempo bass-groove. After a Coding Party he came in contact with german Game developer Thalion Software to make the famous ST-Conversion of "No Second Prize" in 1993. ﻿﻿RockABIT: Why making music on Soundchips? The Exceptions wrote a handful of articles in a German computer magazine (68000er, later ST Magazin), which were also translated into English and released in ST News. Anyhow, these articles for me were the stepping stone that got me started. And since I was a one-dude operation at the time (Abacus Crew was a short-lived cross-platform team with the above mentioned friends on C64 and Speccy), and I had no clue about ripping music, I resorted to figuring out a music player by myself. My first steps with sound on the Atari ST were on how to use the XBios' dosound() system call from GFA Basic. Ugh - I can't recommend that to anyone, but at the same time it did give some interesting results after tinkering for a while. Next, I used Mad Max' simple music player he had published in the magazine ("ST Symphony"), and expanded it more and more, gradually replacing bits of code and extending the set of effects. I completely rewrote the player at least twice since then. RockABIT: Your greatest achievement in Sound programming on the ST? Hmmm, I guess that would be my drum sounds. I spent a lot of time optimizing the pitch, noise and volume sequences to closely resemble real (sampled) drums. 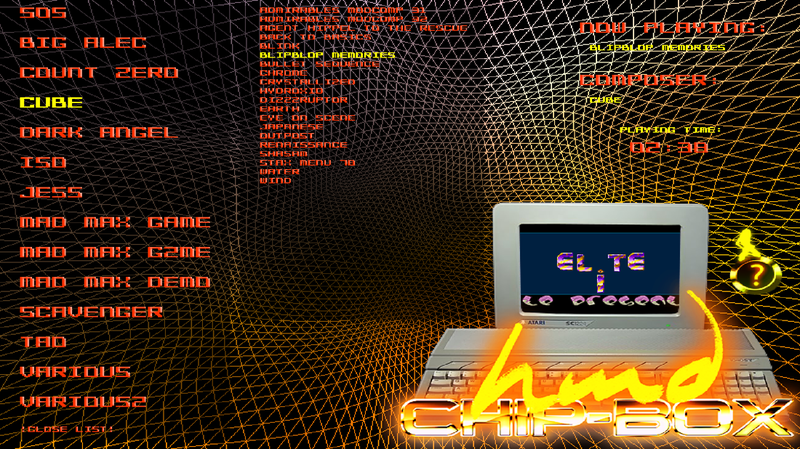 ﻿RockABIT: Which chiptune (any system) is special for you and why? Twilight Beyond - Johannes Bjerregard (C64): Just an epic bass line and slow build up that sets a certain romantic mood. I also love how the mood later changes from minor to a major key, very hopeful. I converted this tune (pretty badly) to the ST, and about 7 years ago I reworked most of it into a proper arrangement in Logic Express, but it's still incomplete. I still hope to release it some day, like I did with my Prophecy remake. The Dancer - Tao (ST): I love, love, love that tune. Fantastic energy, incredible timer-based lead voice. I've been working on a down-tempo piano-ballad remake of this tune for quite some time now, but: tempus sufficiens nunquam est (or something like that). Dignified - Reyn Ouwehand (C64): What an epic song! Captures you from the first second. DBA-Mag 6 - Scavenger (ST): I don't need to explain this one. Of my own works that would be Prophecy, without a doubt. That is my crown-jewel, my magnum-opus. Even though it is pretty long and has multiple "sections", writing it was pretty fast by my standards. And I can still listen to it, which says something. RockABIT: Where did your musical Influences came from? One of my earliest influences (not necessarily on my chip tunes, but music in general) would be Mike Oldfield. After discovering Tubular Bells in my uncle's record collection and copying it to tape, I spent hours listening to it every day, studying it, creating my own mental imagery to go with the soundscape. Fantastic stuff. Later I discovered Prog and Neo-Prog like Genesis and Marillion, Yes, etc., but also synthesizer music like Jarre and Vangelis. Even though I also enjoyed regular radio music, I definitely developed a certain penchant for the complexity of Prog Rock with its odd time signatures, complex melodies and chord structures, etc. to keep my mind busy and attentive. More specific to chip music, my influences stem more from the classic C64 composers like Hubbard, Galway, Ouwehand, Tel, etc. as well as my fellow Atari composers. 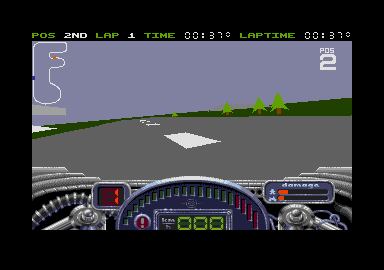 Though, when I started, it was really only Mad Max on Atari (as far as I was aware at the time). Triplex was Big Alec's personal sound-editor he programmed completely by himself. But before the release in 1992 he hacked every note and songdata into pure assembler code. In 2004 Damo of Reservoir Gods implemented new GUI Features, sound effects, as well as Falcon compatibility and renamed it to Triplex 2k4 (right). Ah, much simpler. You knew your system inside out, could greet every bit by name. These days there is so much software running on your system that you don't know it's there, or that you have no clue what it's doing, it can be scary. And, let's face it: most people don't even need a real computer these days, since all they do is use the browser. Now, when you want to actually program something, you first need to install a development system with gigabytes of content. RockABIT: Does your Demoscene experience have an effect on your Life today? ​On my professional life, certainly. It's what has started me on programming and software development. I currently work as a developer for a Digital Signal Processing tool targeting re-programmable microchips (FPGA), which is a job that sits right at the sweet spot between software and hardware, so a lot of the experience programming assembly language as a teenager comes in handy for that. Once, while at Intel, I even wrote some hand-optimized x86 assembly for squeezing the last bits of performance out of a crypto algorithm. 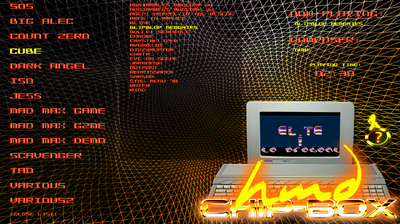 So I definitely still make use of what I learned during my demoscene years. 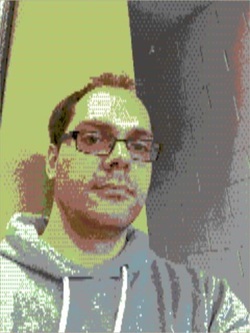 Socially, I enjoy keeping in touch with my friends from the demoscene over the years, and even making a few new ones. But other than that I don't think it's had a major influence on my life. RockABIT: What do you think about the actual retro-phenomenon? I don't really have much of an opinion on it. I enjoy the Atari nostalgia, and also some of the adjacent scene revivals, but to be honest, for me personally it keeps coming and going over time. RockABIT: Are you still composing? Any plans? Every once in a while I load up Logic on my laptop and browse through all my song fragments, to see what has potential and maybe work a bit on a song. But life these days is so hectic with a 5 year old and as two working parents, there is not much time left for this stuff. I'm kinda hoping that I can reclaim some time once my son gets a bit older and doesn't want anything to do with me anymore... ok, that sounded really sad! Truth is I love my son! RockABIT: After your first releases you have managed to squeeze some remarkable drum sounds out of the ym-chip. How have you done it? Lots of sweat and tears. Elbow grease. Trial and error. No secret to it, other than also having the right tools at my disposal. For example, my editor (and from what it seems a bunch of other ones as well), has a way of changing all relevant sound parameters (pitch, noise, volume) over time, at least once every VBL. With that, all you need to do is to listen to drum sounds very carefully, study the envelope, the dominant pitch and its change over time, as well as change in noise frequency over time, and try to reproduce it. I guess I have a talented ear and was able to use it. RockABIT: Working as a professional you made the music-conversion for the well known racing game No Second Prize for the Atari ST. Please tell us a little bit about the work with Thalion. First off a clarification: I never composed the music for No Second Prize. 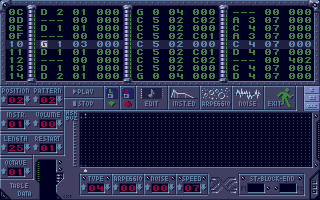 It was composed by Matthias Steinwachs for the Amiga version. All I did was to convert the music to the ST. Same for all the other commercial work I did. My memory is a little fuzzy about how it all started. I think Erik Simon remembered me from the ICC#2 party, but didn't have my contact info. I think he got in touch with Flix first, who then gave him my number. Basically, he needed me to convert the Amiga soundtrack to the Atari, so he put me into contact with Matthias Steinwachs, the composer of the Amiga version of NSP. I never worked at Thalion's offices, since I was still in high school at the time. After NSP there were a couple non-Thalion projects, all of them very small in scale, like Locomotion or Heli. Matthias contacted me directly whenever he was working on a project that he knew needed a conversion to the Atari. 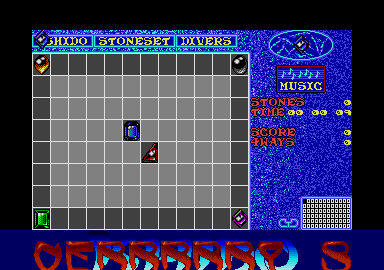 The last big project I worked on for Thalion, but which never got completed, was the Atari ST soundtrack for Ambermoon. Unfortunately, the project got cancelled before the music was finished, but about a dozen or so tunes were completed. RockABIT: How did you get started as a musician? Directly on the computer? More or less. I never really saw myself as a proper musician, though. I took guitar lessons when I was in elementary school, and was self-taught ever since, even on the piano. And even though I briefly played in a high-school rock band, for me the computer was the preferred tool to get a musical idea realized, without needing the proper discipline to master my instruments. As a result my guitar and piano playing is still pretty bad. RockABIT: Any advice to a newbie in chip composing? No, I don't think advice is necessary. There are a lot of tools out there with varying degrees of help available if you get stuck, but the most important thing is to have some sort of creative drive. Dig in, play around with the tool, and just go for it. If it sounds good, then great! Just don't expect results over night. RockABIT: Speak a little bit about you. Age, habbits, Life, ... what you want. I'm 42 years old ... wait, what was the question? (see what I did there! ), live in San Jose in expensive California with my wife and son. After getting a Ph.D. in computer engineering and working for Intel Corporation for seven years, I now work at Xilinx as a software engineer for a DSP design tool. Boring! Anyhow, I'm a pretty regular Joe otherwise, a typical family man. Thanks for listening to my old tunes! ​RockABIT: Thank you very much for your time and good luck for every of your forthcoming projects!